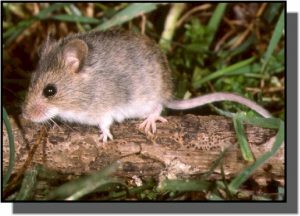 Comments: Western harvest mice resemble house mice and are sometimes seen when hay is harvested. They harvest seeds from sunset to midnight by climbing grass stalks and shrubs. Their soft fur is brownish on top, grayish on the sides and white below. Females produce up to seven litters per year with 3-5 young per litter. They usually live less than a year in the wild. Distribution: Western harvest mice range from southern Mexico through the western half of the United States. They are found in prairies and uncultivated croplands in Kansas. Food: Western harvest mice feed on seeds of grasses and wildflowers, young plants and insect larvae. They consume up to one-third of their weight per day.